The best yoga mat I've ever used is the eco-friendly, open-cell natural rubber Jade Professional Harmony Yoga mat. I want my yoga practice to be healthy for me AND for the environment. So when it was time to replace my old, worn out yoga mat, I decided to "go green" and look for an eco-friendly mat. Take a look at this mat if you're interested in an eco-friendly yoga mat. 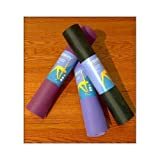 A few years ago I started researching yoga mats to decide what would be the best eco-friendly yoga mat for me. Up until then I had used the standard, inexpensive PVC (polyvinyl chloride) yoga mats for years, and for the most part they worked fine. However, I've since learned that during the production of PVC products, including these standard yoga mats, toxic chemicals are given off that harm the environment and our health. Also, PVC yoga mats aren't biodegradable, and if they end up in a landfill, they may leach out more toxic chemicals. I want my practice of yoga to be healthy for me AND for the environment! So I researched eco-friendly yoga mats, read many reviews, and tried three different kinds of earth-friendly yoga mats before settling on one that has worked great for me. The eco-friendly yoga mat that works best for me is the Jade Harmony Professional Yoga Mat. Why do I like my Yoga Mat? It has a great non-slip surface. It's a little thicker (3/16") than my old yoga mats (1/8"), so offers a little more cushioning. It feels sturdy and durable. It lies flat, rather than bunching up like cheap standard PVC mats often do. It has worn very well over the two years that I've used it. The Jade yoga mat that I bought is made of open cell natural rubber, a renewable resource. That's what first drew my attention to this mat. It also gets great reviews from owners. As I mentioned above, my mat has worn well. I use this mat many times a week, when I teach (9 classes/week) and when I practice at my studio. After two years of heavy use, it's only shown minor signs of wear. This is compared to another natural rubber yoga mat (see below) that I've tried, and showed major signs of wear after a couple months. First I tried the YOGA Accessories 5mm Eco-Conscious Yoga Mat, which is made from TPE (Thermo Plastic Elastomer), a relatively new material. It's still a man-made, plastic material but no toxic materials are used, and it is biodegradable and recyclable. This mat is 5mm thick, and costs about $40. I bought a few for my yoga studio and many of my students prefer this mat over the regular PVC mats. I prefer a less "spongy" mat, though. This one didn't do it for me, but if you like a thicker eco-yoga mat at a more affordable price, this would be a good option. The next eco yoga mat I tried was the eKOlite Yoga Mat by Manduka. This mat is made from closed-cell rubber (the Jade Yoga Harmony Professional Yoga mat is made from open-cell rubber -- a spongier material), and is 1/8 " thick. The price was reasonable too, about $42. I liked this mat to begin with -- It had good grip, and it was reasonably light, but sturdier than the PVC yoga mats. BUT ... it started degrading after a couple months. It left little rubber pieces on the floor and on my yoga pants. I liked it enough that I bought a second one, hoping the first had somehow been defective. But the same thing happened. I know it's supposed to be "biodegradable", but I didn't want it "biodegrading" while I was using it! PERHAPS ... I would've had a better experience with the eKO Yoga Mat Standard by Manduka which is 3/16" thick, the same as the Jade mat. It has good reviews. But the Jade Harmony Professional Yoga mat has even better reviews. Are There Drawbacks to the Jade Harmony Professional Yoga Mat? Well, the cost initially was certainly a drawback for me. I got over that. I've heard that people who practice vinyasa-style yoga can't slide their feet easily on the Jade mat when transitioning from Chaturanga dandasana (plank pose) to Urdhva mukha svanasana (upward facing dog pose). That's true -- I can't roll easily to the top of my feet from plank to upward dog pose, but that's not a concern of mine since usually I don't do a vinyasa practice (I practice Iyengar yoga). Apparently the Manduka Eko mat has enough slip to make this transition easier. Exposure to heat and sunlight will degrade the yoga mat. A friend of mine says hers has started to show more signs of wear than mine, since she keeps hers in her car in between classes, and the excessive heat during the summer hasn't been good for it. For me, the benefits of this mat far outweigh any drawbacks. Take a look at it yourself, and I bet you'll love this mat too! Thanks for your comment, Brenda. Yoga has been such a boon for me. The mat is important...but the yoga is much more so! This reminds me. I need to get back to my yoga. I need a yoga mat also. Thanks for the info. Thanks for your comment, Tolovaj. Yes, there are many options for yoga mats! I've been trying out the eco friendly options more recently. It's too bad that they're more expensive than other options, but if we can find the one that works well for us, it's a good investment. I'm glad you liked the review, katiem2. It's a great mat, although somewhat on the pricey side! But it's been a great yoga mat for me.